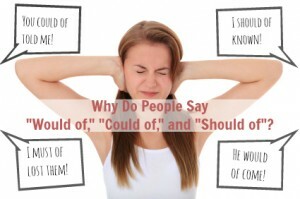 Home / Blog / Why Do People Say “Would Of”? Thanks for the idea, Rhonda. This is one of those issues that irritate the conscientious grammarians among us, but I hope you can see that the mistake is understandable. Notice I said mistake. As much as I lean toward descriptivism, I do think there are numerous principles of language that to violate would constitute an error. This is one. To explain fully, let’s review modal verbs. She could come to the party. You should not drive my car wearing that gorilla suit. Ed must deliver my granola to the concierge. Carl would not negotiate with a poodle. She could have come to the party, but I didn’t see her. You should not have driven my car wearing that gorilla suit. Ed must have delivered my granola earlier. Carl would have never negotiated with a poodle. Still no problem really, but in common speech, most people contract the helping verbs. Instead of saying could have, should have, must have, or would have, we say could‘ve, should‘ve, must‘ve or would‘ve. It’s just easier to blur the sounds into each other and speak in contractions. It’s perfectly fine to do this, especially in casual conversation and informal writing. But to many people, could‘ve, should‘ve, must‘ve and would‘ve sound exactly the same as could of, should of, must of, and would of. And since that’s what they hear, that’s what they say and that’s what they write. This doesn’t make it correct, but it makes me a little sympathetic. If this is a mistake you have made in the past, I hope I’ve helped you avoid it by understanding why it’s wrong. If you are a strict grammarian whose feathers get ruffled by this, I hope I’ve helped you be a bit more understanding. By all means, correct the error when necessary, but let’s be patient with each other as we do. Bloggers love comments. Make my day and leave your thoughts in the Reply section below. “Past” or “Passed”? “Pastime” or “Pass Time”? I found this very interesting. I also get annoyed when people say would of or could of. Instead of have. I also find that his is used instead of he’s . One thing I find most annoying is the mispronunciation of the word specific. Grr !!. Why do people say Pacific?. Actually I’m not the least bit sympathetic, it’s just more proof of how parents, teachers, and students themselves have failed and shows our educational system is garbage and also proves how stupid Americans have become.